Derbyshire beat Durham by 125 runs to win their first Specsavers County Championship match of the season for the second year running. 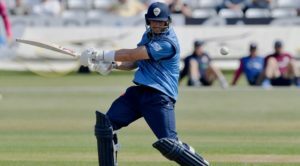 Matt Critchley and Logan van Beek inspired Derbyshire to victory as the home side claimed the final eight wickets required on the fourth day in Derby, making it back-to-back open round wins at The Pattonair County Ground. 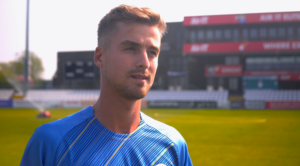 The leg spinner claimed three wickets, including the first two of the morning, while van Beek took two as well as a one-handed diving catch to turn the game in Derbyshire’s favour. Resuming on 10-0, Durham captain Alex Lees and all-rounder Gareth Harte continued with their watchful approach, but looked to increase the scoring as batting conditions improved throughout the morning. They guided the visitors to 83 without loss before an invigorated Critchley struck twice in as many balls to remove Lees (59) and Will Smith (0). He almost had a third when a sharp diving chance was put down by Alex Hughes at second slip, giving Michael Richardson a lifeline on nought. Harte reached a battling half-century, off 164 balls, but Richardson succumbed after lunch, bowled by Rampaul for five. Jack Burnham (32) added 52 with Harte, but once he was out to Wayne Madsen, acrobatically caught by van Beek, Durham began to fall away and any hope of a chasing the total faded. The over after taking the catch, van Beek picked up a wicket of his own, nipping one back off the surface to beat Harte through the gate and remove his off stump. 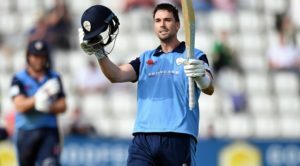 Buoyed, Derbyshire pressed home their advantage and five of the final six batsmen were out for single figures as Ben Rain (5), James Weighell (4) and Matt Salisbury (4) all fell either side of Derbyshire taking the new ball. Liam Trevaskis (27 not out) showed resistance in an ten-over long stand with Chris Rushworth, but Luis Reece had the number 11 lbw to the last ball before tea, earning Derbyshire victory in the opening Specsavers County Championship match of the summer.